Pictured Theodore Shaughnessy, and the man’s suspected assailants, teen son, Nicolas Patrick Shaughnessy and wife, Jaclyn Alexa Edison. The father was shot multiple times at his Travis County, Austin area home (inset). 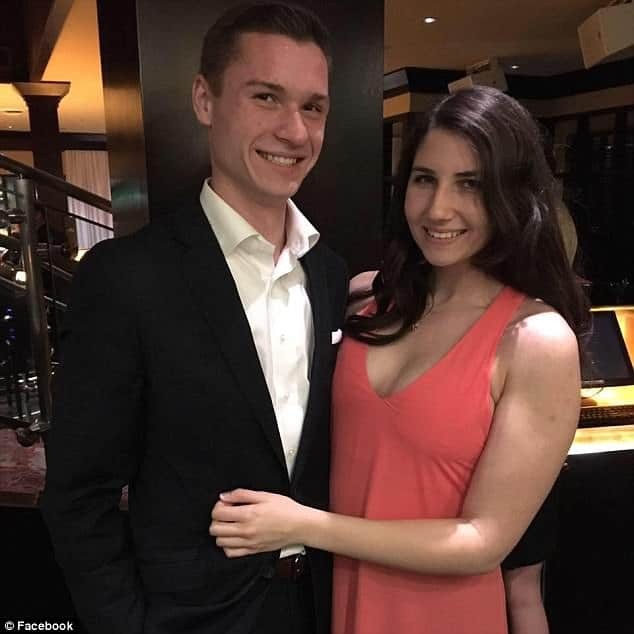 Nicolas Patrick Shaughnessy and Jaclyn Alexa Edison murder for hire plot uncovered. Travis County investigators believe the son of a prominent Austin area jeweler and his wife conspired to take his parents out for his multimillion life insurance policy and sale of business. 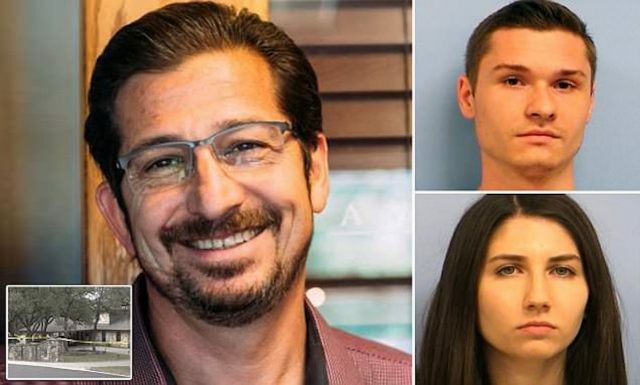 The son of an Austin, Texas-area jeweler and the teen’s girlfriend (revealed to be his actual wife) have been charged with murder after allegedly hiring a hitman to kill his father. In a press release, the Travis County Sheriff’s Office stated the father’s death occurring in March when Theodore Shaughnessy, 55, was shot dead during a home break in. 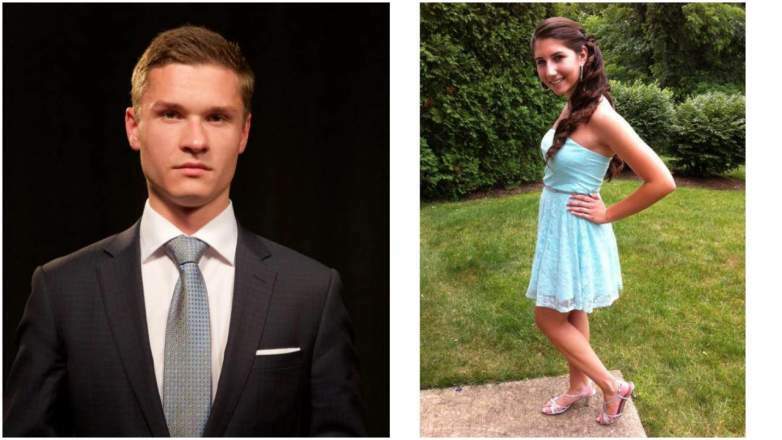 Booked was 19 year old teen son, Nicolas Patrick Shaughnessy and girlfriend, Jaclyn Alexa Edison, also 19. The couple who live together in College Station were arrested Tuesday on a count of criminal solicitation to commit capital murder, Travis County sheriff’s officials said. Come Wednesday the teen couple remained in custody, with Shaughnessy’s bond set at $3 million and Edison’s at $1 million KXAN-TV reported. Nicolas Shaughnessy and Jaclyn Edison show no emotion at crime scene, with son joking around. According to investigators, Shaughnessy’s mother, Corey Shaughnessy, called 911 in the early morning hours of March 2 to report an intruder in the family home. Deputies sent to the home found Theodore Shaughnessy dead of multiple gunshot wounds. A family dog was also killed. Authorities say the murder plot for hire called for the mother to be killed as well, but she was physically unharmed. Travis County Sheriff’s Office in a statement told of Corey Shaughnessy surviving the attempt on her life after returned gunfire and hiding in a closet until police arrived after calling 911. According to the affidavit filed in the case against Nick Shaughnessy and Edison, the younger Shaughnessy remotely logged into his parents’ security system and deactivated the alarms on the night of the home invasion allowing the shooter(s) access. The affidavit also noted after the son and his Edison arriving at the family home, with police noting Nicolas Shaughnessy not showing any emotion and not expressing any concern for his injured mother. At one point the son preceded to joke around with Edison why by then had been calm becoming visibly distressed when asked to submit for a gun residue test. An April 29 post on the Gallerie Jewelers Facebook page indicated Nick Shaughnessy recently taking over the family business after his father’s death. Read the post, ‘We are happy to announce that Nicolas, Ted’s son, will be carrying on his legacy here at Gallerie’. Nicolas Shaughnessy and Jaclyn Edison go shopping for murder for hire hitman. In the months before the shooting, the Austin American-Statesman reported Nicolas Shaughnessy approached multiple people asking if they were willing to be paid to kill someone, investigators allege in an arrest affidavit. He estimated that he’d receive some $8 million from the life insurance policies for his parents, from the sale of their home and sale of the jewelry store. A regard of the teen couple’s texts revealed countless text messages over preceding months corroborating their intent to murder the teen son’s father for money. In some texts, the couple exchanged numbers they could afford to pay hit men. Other texts included the son telling his girlfriend the millions of dollars of money he stood to make off his parents’ deaths. Further investigations revealed the young couple who lived together secretly marrying each other upon turning 18. Authorities also told of finding ammunition in the teen couple’s home that matched casings found at the crime scene. Following the teen’s arrests, Nicolas Shaughnessy’s mother, Corey, told of her intent to stand behind her son. 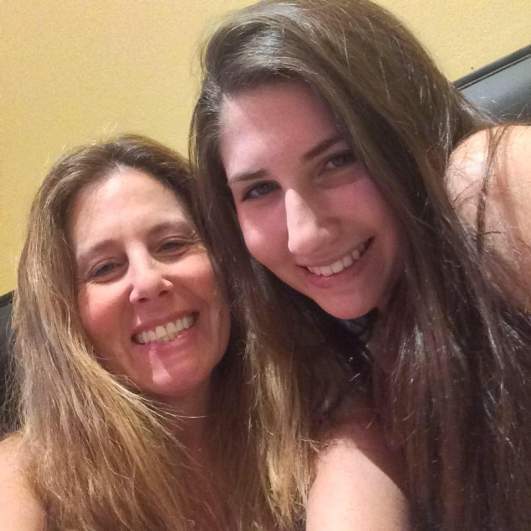 Jaclyn Edison pictured with her mother. The daughter hails from New Jersey.